All transactions are safe and secure with a reliable history in online purchasing behind each of our associates. Buy the Freddy, Jason and Michael Scream Team t-shirt to own Nightmare on Elm Street clothing and merchandise. Some people are able to overcome their differences and end up best friends. This Freddy tee features Freddy and his BFFs, Jason and Michael, posing together. Michael is holding his kitchen knife, while Freddy is showing off his sharp razor glove. Wes Craven's idea of a ghost serial killer that murders people in their dreams is a genius concept. These are three of the few horror franchises that can still give me the heebie jeebies. 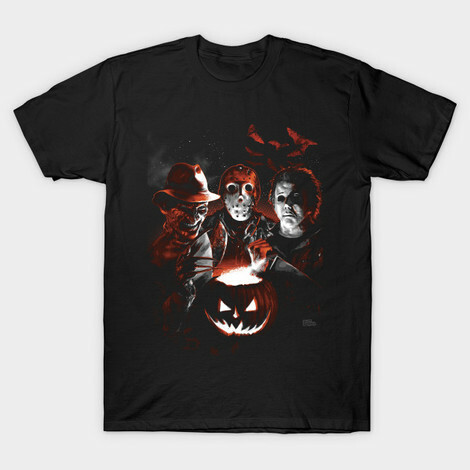 If this trio hanging out together gives you the creeps, then snag this Freddy Krueger A Nightmare on Elm Street shirt today. In addition to the Freddy, Jason and Michael Scream Team tee above, browse the Nightmare on Elm Street Clothing Gallery for more apparel like men's and women's clothes, kids shirts or hoodies.